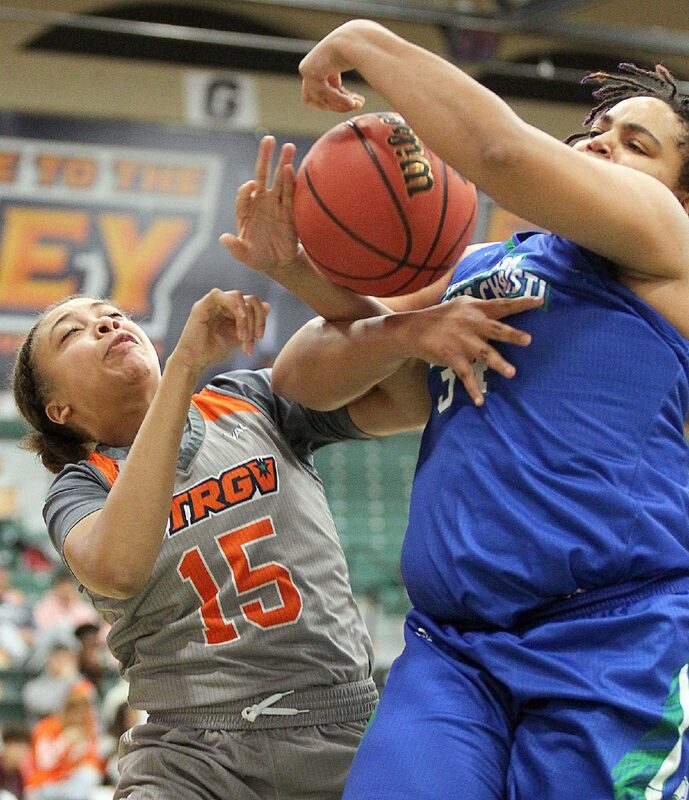 UTRGV Krisynthia Sampson (21) is stripped of the ball by Texas A&M Corpus Christi Dae Dae Evans (12) during the first half of an NCAA game at UTRGV field house on Monday Nov.12, 2018, in Edinburg. 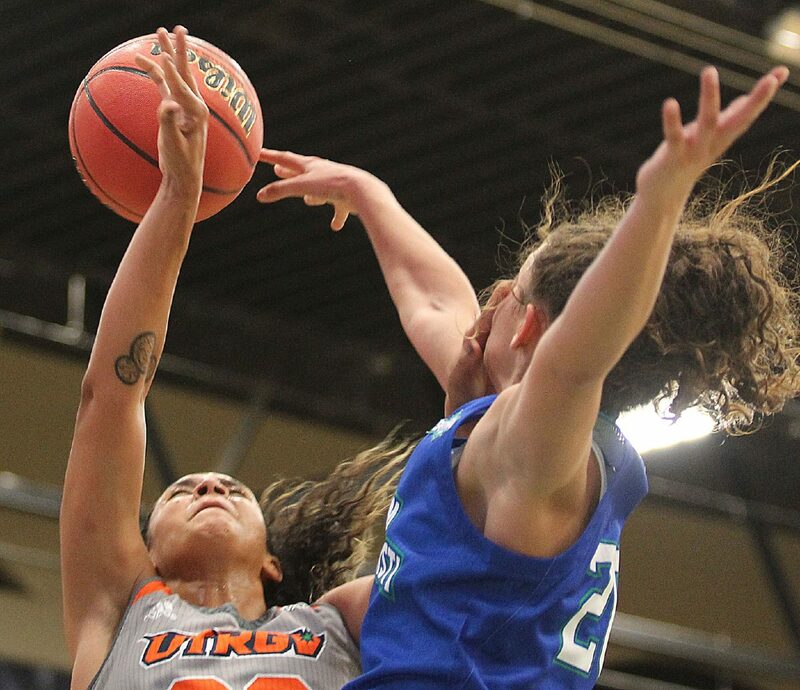 EDINBURG — UTRGV did everything it could to mask a poor shooting game against Texas A&M-Corpus Christi on Monday night in Edinburg at the UTRGV Fieldhouse. Strong defense and hustle to outrebound the Islanders didn’t equate to a win. A&M-Corpus Christi pulled away in the fourth quarter for a 59-49 victory over UTRGV. The Vaqueros drop to 1-1 on the season, after winning their opener Saturday. 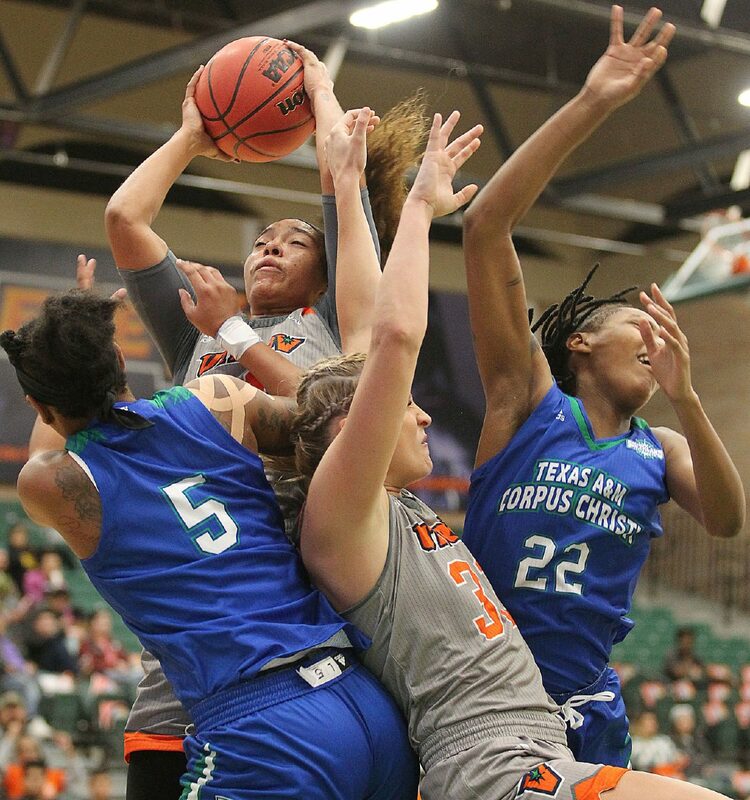 Texas A&M Corpus Christi Dalesia Booth (22) battles for position against UTRGV Nichele Hyman (15) and Krisynthia Sampson(21) during the first half of an NCAA game at the UTRGV Fieldhouse on Monday Nov.12, 2018, in Edinburg. UTRGV Quynne Huggins(11) and teammate Madison Northcutt (32) collide with Texas A&M Corpus Christ Uri Jolivette (5) and Dalesia Booth (22) during the first half of an NCAA game at UTRGV field house on Monday Nov.12, 2018, in Edinburg. 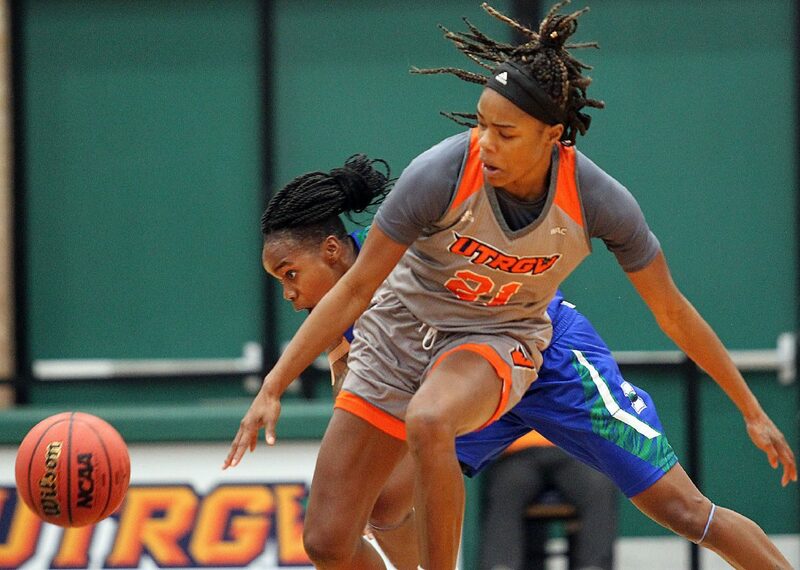 UTRGV Nichele Hyman (15) battles for a rebound against Texas A&M Corpus Christi Tiara Matthews (34) during the first half of an NCAA game at UTRGV field house on Monday Nov.12, 2018, in Edinburg. 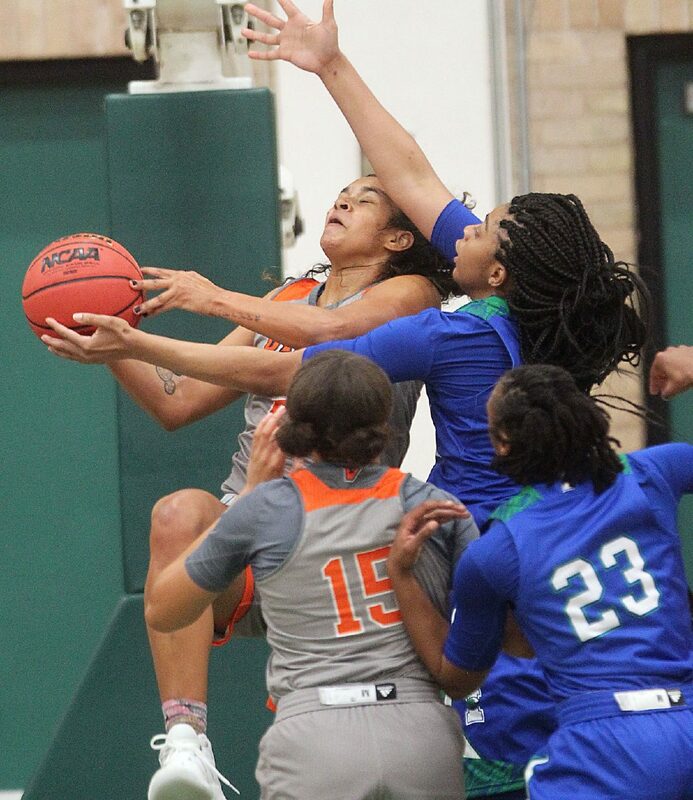 UTRGV Makaela Mosley (23) battles for a rebound against Texas A&M Corpus Christi Arhianna Sims-Jackson (33) during the first half of an NCAA game at UTRGV field house on Monday Nov.12, 2018, in Edinburg. 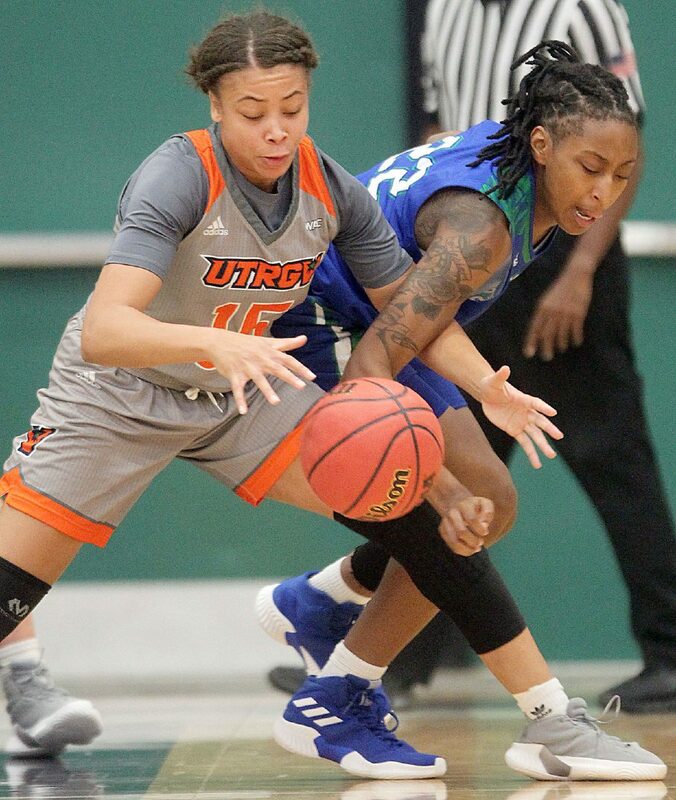 UTRGV Nichele Hyman (15) fights for a loose ball against Texas A&M Corpus Christi Dalesia Booth (22) during the first half of an NCAA game at UTRGV field house on Monday Nov.12, 2018, in Edinburg. UTRGV Makaela Mosley (23) get her shot blocked by Texas A&M Corpus Christi Makinna Serrata (22) during the first half of an NCAA game at UTRGV field house on Monday Nov.12, 2018, in Edinburg. 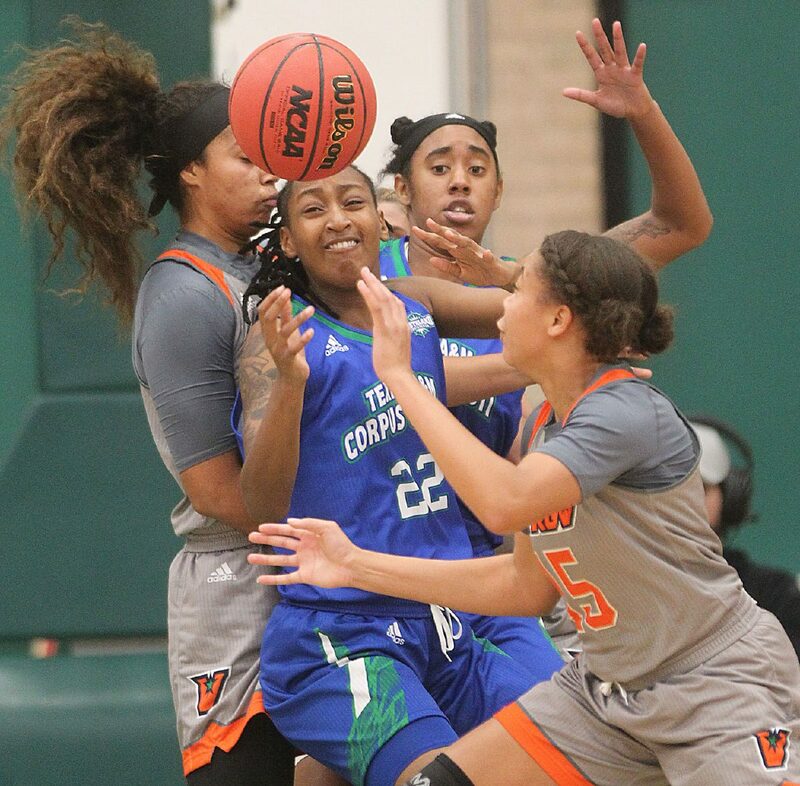 UTRGV Krisynthia Sampson (21)is defended by Texas A&M Corpus Christi Dae Dae Evans (12) and teammates during the first half of an NCAA game at UTRGV field house on Monday Nov.12, 2018, in Edinburg. Knocking down shots was an issue from the start for the home side. In the first quarter the Vaqueros hit 4-of-12 shots and in the second quarter, they went 3-for-15 for a 25.9 FG percentage at the break. The size advantage was evident for the Islanders. Junior Alexes Bryant towered at six-foot-three-inches, four inches taller than Madison Northcutt who guarded her most of the night. Makaela Mosley, who is six-feet, also matched up against Bryant at center. Even in the loss, there were bright spots in the Vaqueros first game against Division I competition this season. UTRGV won the rebounding battle 48-36, including 25-10 on the offensive boards. “We really tried to keep them off the boards and dig down on them and just keep them out of the paint as much as we can,” Krisynthia Sampson said. Sampson had seven rebounds and eight points. She played more than 28 minutes after playing in 19 two nights ago. Forcing the Islanders into foul trouble was key to keeping the score close and hovering within striking distance. At halftime, UTRGV had already shot 16 free throws, converting on 10 and only trailed due to a late three-pointer. 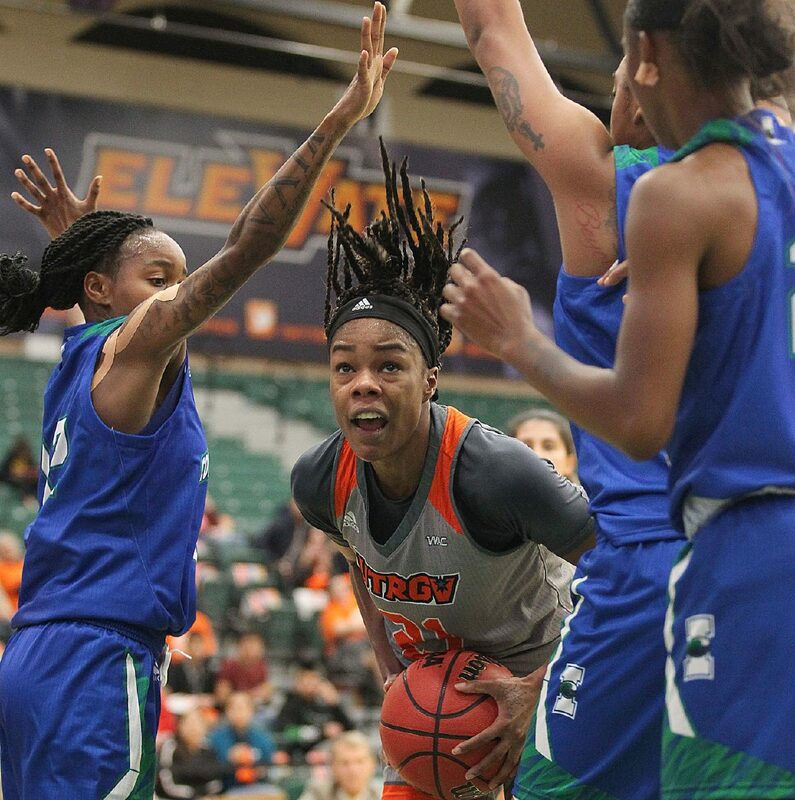 Point guard Amara Graham was the most consistent scorer and free-throw shooter for a second straight outing for UTRGV. Her drives to the hoop netted five layups and she earned several trips to the line. She finished with 13 points to lead the team. “I think with their defensive pressure they like to deny a lot so that just opens more gaps to get to the basket,” Graham said. “I just took advantage of that, going into the night. The officials’ whistle got plenty of use in the first half thanks to 14 fouls against the Islanders and nine against the Vaqueros. UTRGV was also frequent offenders of traveling violations to give the ball back. The three-point ball was hard to find all night for the Vaqueros. They finished 3-for-21. Idil Turk had open looks but only drained one three-pointer in seven tries. A hot start out of the halftime break allowed UTRGV to take a pair of short leads in the third quarter but not again after a 39-38 advantage with 1:20 to play in the third. The Islanders were led by the trio of Dalesia Booth, Dae Dae Evans and Bryant down the stretch. Bryant hit a shot to inflate the Islanders lead to 51-43 with five minutes to play. She finished with a game-high 15 points despite sitting for periods in the game with foul concerns. UTRGV begins its first road trip of the season starting Wednesday night in San Antonio against UTSA. The road trip will see the Vaqueros face Canisius in Buffalo and UMass in Amherst before returning home Nov. 25 to host St. Thomas.